The process by which a party called the lessee uses the asset of another party called the lessor for a pre-decided the period of time in return for a regular payment is called leasing. This is a legal agreement that binds the two parties by law. Any breach of contract by any one party can be contested in the court of law. What is lease agreement form? The lease agreement is a legal contract between the lessee and the lessor that requires signatures of both the parties. The condition that might be applied upon completion of the lease. In many cases, the termination of the lease period may end the lease of the asset. In other situations, there may be a release clause or buyout condition whereby the lessee will get the ownership of the asset after the lease completion date. 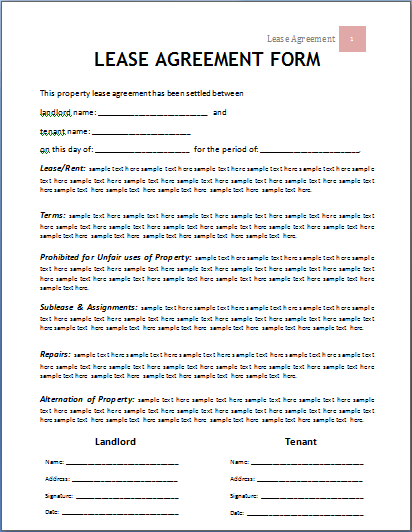 This lease agreement form acts as a proof or evidence that the lease has been executed between the two parties.